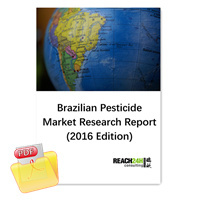 This market study covers various segments of the Brazil pesticide market for arriving at the full understanding of Brazil pesticide market. The report is segmented into four main regions: Part 1- The general situation and the development of agriculture in Brazil. Part 2-The situation of agrochemical market in Brazil. Part 3- The situation of product registration in Brazil. Part 4- The situation of company establishment in Brazil. From this research report, readers can get a full understanding and acquaint a comprehensive information of Brazil pesticide market, including both detailed market information(such as the top annual sales pesticide, herbicide, fungicide product in Brazil, Brazil's crop distribution plate products, and the main Brazilian market participants information) and professional pesticide registration information in Brazil(such as the registration type, requirements, procedures, time and cost, other licensing related to pesticide, the establishment of the company in Brazil and the pesticide registration consultant information).